Blessed with large tracts of land, many universities are developing their surplus holdings to raise revenue. When Michelle Srdanovic and her family moved to the top of a mountain in the Vancouver suburb of Burnaby 11 years ago, they became part of a grand experiment. The three-bedroom townhouse they settled into – cheaper than anything similar in Burnaby at the time – was in a new development on leased land that belonged to a trust created by the adjacent Simon Fraser University. It was part of a nascent community being created out of the forest, with not much around it except academic buildings. “At the beginning, there was very little community infrastructure – no grocery store, no bank,” said Ms. Srdanovic, a therapist and counselling instructor. People were a little hesitant at first about buying in the area. But the lower prices – a reflection of the uncertainty about the value of property on leased land – were a definite plus. Since her family moved there, they’ve discovered other benefits. Students in the university’s teaching program are heavily involved in the new community’s elementary school. SFU’s library and theatre outrival standard suburban amenities. And residents can sometimes rent sports facilities or other spaces at discounted rates. As well, the UniverCity development, as it’s called, now has a busy main street complete with grocery store and bank. The local restaurants tend to be heavily student-oriented, says Ms. Srdanovic, and therefore not as appealing to her, but she’s generally pleased with how the neighbourhood has come together. Ms. Srdanovic and her neighbours are reflective of a growing trend among many Canadian universities that are lucky enough to have large tracts of spare endowed land. Since the excess land will likely never be needed for future academic buildings, these institutions can use it for commercial and residential developments such as shopping malls, business parks and housing. For SFU, the benefits are twofold. First, the development creates more of a connection between the university, built in the 1960s in the splendid isolation of the summit of Burnaby Mountain, and the city around it. “Some talked about bringing SFU to the city, by having buildings downtown. Then we realized we needed to bring the community to the campus,” says Gordon Harris, the CEO of SFU Community Land Trust, which oversees the UniverCity development. The other goal is to generate revenue – something that SFU, like many universities, is more than a little interested in as provincial government funding continues to decrease as a percentage of total operating revenue. Many postsecondary education institutions around the world have been taking a look at this idea, says Wim Wiewel, an American academic who co-edited the 2005 book, The University as Urban Developer. Dr. Wiewel, who was recently named president of Lewis & Clark College in Portland, Oregon, says universities in cities from Helsinki to Miami to Lüneberg, Germany, sit on land that was given to them decades ago, with the idea that they might need it for expansion. But these institutions aren’t growing at the rate they once were. “They’re seeing that they’re not going to need it, so rather than land-banking, they’ve decided to use it,” he says. In Canada, the situation is somewhat different, in that most universities have continued to expand significantly over the past couple of decades. Nevertheless, there are many Canadian universities – in particular, those located on the outskirts of major cities or in smaller communities – that have more land than they’ll likely ever use for academic purposes. In Canada, the University of British Columbia is the pioneer of university real-estate development. Its first residential project, in 1984 – the brainwave of a prosperous real-estate investor, Robert Lee, who was on the university’s board of governors at the time – generated an $81-million profit for the university, according to UBC Properties Trust, the entity created to oversee the development. A decade later, UBC embarked on a longer-term development program that continues to this day. With SFU pursuing a similar path, the two West Coast universities are seen as leaders in this area, and not just in Canada. Australian and Israeli university officials have been visiting recently, intrigued by the results they see from afar. UBC expects to have amassed $675 million from real-estate profits as of this academic year and as much as $2 billion in the next 20 years, depending on market conditions and the timing of development. It has used $350 million of these funds to invest in student housing, something desperately needed in this high-cost city. 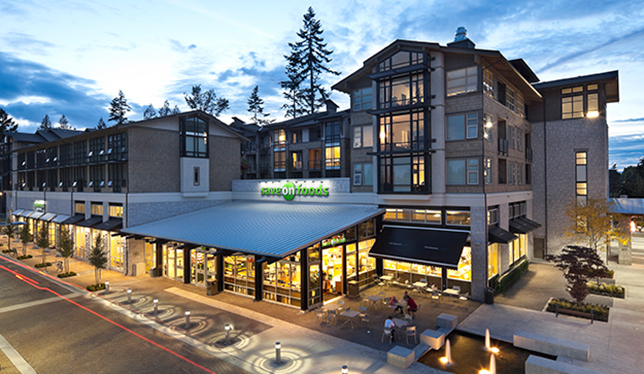 A supermarket and commercial building at Wesbrook Place, the latest neighbourhood development on the University of British Columbia’s Vancouver campus. Photo courtesy UBC Properties Trust. SFU, which plans to have just under 10,000 residents overall in its UniverCity development, has far exceeded its original revenue goals, says SFU Trust’s Mr. Harris. The money goes strictly into teaching and research, he says, not broken pipes or sidewalk repairs. The community trust endowment fund now has a capital balance of $41 million, the proceeds of which go to support various research initiatives. In Ontario, the University of Guelph has led the way, creating the Heritage Trust in 1991 to direct campus development, which now includes an adult lifestyle community, two research parks and retail space. According to the board of trustees overseeing the trust, by 2013 it had a value of $82 million and had contributed over $20 million in dividends to the university to pay for various strategic initiatives. With this level of success, other universities have taken note. The University of Calgary established the West Campus Development Trust in 2012 to develop about 200 acres of land next to the university’s main campus as a new urban village that will, in 15 to 20 years, be home to about 15,000 people and 140,000 square metres of office space. And, just last year, the University of Manitoba created a hybrid limited partnership and trust to develop a new community on a former golf course adjacent to campus that it acquired in 2007. The University of Alberta and Thompson Rivers University also have created land trusts in recent years. 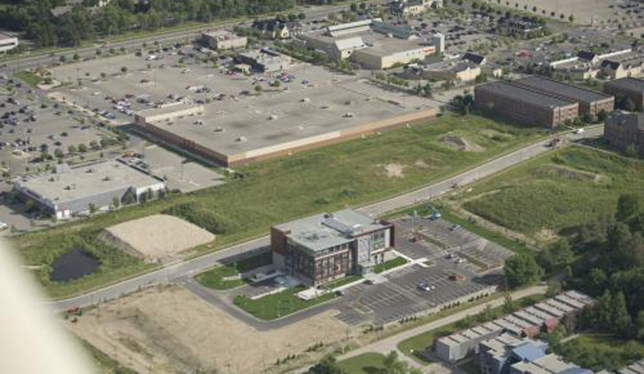 The University of Guelph is opening up new land, as seen from above, for its Research Park North. Photo courtesy of University of Guelph. But, say those involved, it’s not an automatic lottery win for universities to move into real-estate development. Universities can’t act like just any old developer, for instance – they are “held to a higher standard,” says the U.S. development expert Dr. Wiewel. “They’re supposed to be civically more responsible.” Universities that go into commercial development or that sell off some of their land to a builder whose project is uninspiring, he says, may find themselves the object of public disdain. Scrutiny comes from the new residents of these developments as well, says SFU’s Mr. Harris. “People do have expectations,” he says. As a result of this type of criticism, universities doing development work usually set some ground rules early on. Yet, even those that are trying their best to develop interesting, worthwhile projects may find themselves playing defence very quickly. 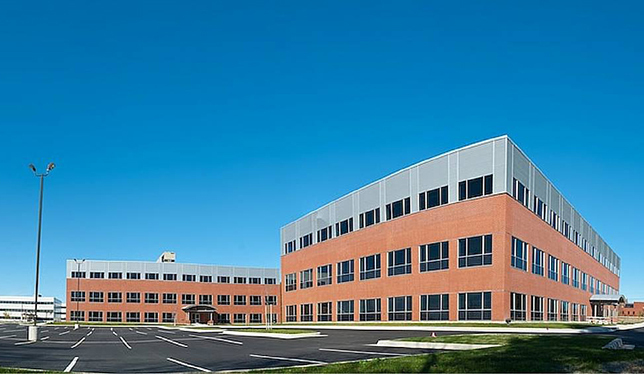 The University of New Brunswick, which has 8,000 acres of endowment land in 13 locations (some of it a gift from as far back as the reign of King George III), started commercial development on various parcels in the late 1990s. “Initially, the university was selling property as a one-off. If anyone came in the door, we’d sell it,” says John Bigger, who was hired in 2009 to manage the university’s property development and is now associate vice-president for campus operations. At a certain point the university realized it should stop selling its land and instead hold onto it through leases, says Mr. Bigger. That’s something that almost every university now does, to reduce criticism that it is permanently giving away part of its legacy. The university also created a long-term development plan. Since then, UNB has dedicated some of its land to a nature conservancy, some for a shopping centre that includes a Home Depot and a Costco, and some for a development called Knowledge Park that is intended to help support high-tech businesses. The revenue, about $750,000 a year, is earmarked for improvements to the university in areas like accessibility and sustainability. The University of New Brunswick’s Knowledge Park in Fredericton. Photo courtesy of UNB. All good, you’d think. But faculty and others became concerned when the university began drawing up its development plan, fearing that a long-standing woodlot would be damaged. Others disliked the idea of a Costco and some complained that none of the supposed benefits of the development would accrue to them. “Communication seemed to be our biggest problem. [The university] assumed people knew what we were doing,” says Mr. Bigger. After several public scuffles, the university did more to involve the public, creating a committee with representatives from students, staff and faculty, as well as putting on more open houses to explain its plans. That has helped reduce tensions, he says. Another issue is that every university considering real-estate development is in a different boat – no two real-estate markets are the same in terms of size and capacity, and laws governing universities differ from province to province. In Atlantic Canada, for example, residential developments don’t generate anywhere near the kind of profits that they do in the West. UNB hasn’t even bothered looking at residential development – there’s no money in it, says Mr. Bigger – while SFU and UBC include retail and office space to provide services to their condo projects, which remain the main focus. In the middle of the two are universities like Trent in Peterborough, Ontario. It recently received approval for an innovation and research park, has an agreement with the city to build an arena and sports field, and is now looking at a small residential village. Unlike UNB, it didn’t want to put in retail development out of respect for Peterborough’s downtown businesses. Then there are the legalities – the laws governing what universities can do with their land are not the same in every province. “Real estate is a provincial jurisdiction and the postsecondary legislation here is different from B.C.,” says James Robertson, who heads the West Campus Development Trust at U of C. In Alberta, for instance, provincial law dictates that universities have to self-finance any development ventures. The university can’t be a co-sponsor or partner. Most universities created trusts to handle their development activities in order to distance these developments from academic leaders and to keep the finances separate. But a trust might be just too much work for a smaller university, says Mr. Harris. Instead, that institution might do better if it undertakes a joint venture with a developer on the one or two projects it envisions, if provincial laws allow it. A major benefit of trusts is fiscal. University activities which are deemed to be profit-making in nature are subject to a tax on corporate profits. A trust has different rules. So, for those institutions that have opted not to create a trust, there’s an obligation to demonstrate that any development is not a pure profit-making venture; it has to be something that enhances the institution’s mission. 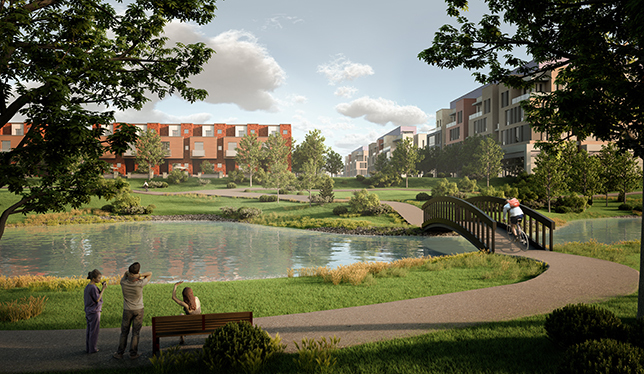 At Trent, for example, the plan for a future urban village encompasses much more than just numbers of units or net revenue. The university envisions it as a “living, learning laboratory” that will include community gardens, new strategies for waste treatment and more, says Julie Davis, Trent’s vice-president, external relations and advancement. This also plays to Trent’s strengths in its environmental programs, she says. Proposed development plan for the University of Calgary’s west campus. Photo courtesy of West Campus Development Trust. Fiscal matters aside, universities are conscious that any new development will be viewed as a potential advertisement for, or a stain on, the university’s reputation. As a result, university development planners are hyper-conscious about setting the bar high for the projects that they allow. At SFU, Mr. Harris says the trust consciously chooses smaller, independent or family-run companies to do their projects, people whose main objective will be serving the local market rather than building for wealthy offshore investors. “We can help model good behaviour for all development,” he says. SFU and UBC have also invested considerable effort into making their projects as green as possible. The childcare centre at UniverCity, for example, has been heralded as the “greenest daycare on the planet.” At UBC – which, unlike most other universities in Canada, operates as a quasi-municipality that sets its own rules – there is any number of experiments in green building. “We get to test things on the ground in a much more expeditious way,” says UBC’s Mr. White, whose department has a staff of 50. Like Trent, UBC sees its campus – including its residential developments – as a living lab where students in different programs are encouraged to work on projects that result in a more environmentally friendly university. The university is looking at generating energy through bio-waste and expanding the use of solar panels, and exploring new ways of reusing stormwater. All of the above makes development a potentially daunting task for universities as they face the complexities of community approval and the pressures to build better than anyone else. But, one advantage for universities is that they can afford to be patient – unlike private developers, they don’t need to show an immediate profit and they’re not going anywhere. Except that there is no theatre onSFU campus. They moved that program downtown years ago. The Library is buying fewer books than usual and very little fiction. Most magazines and journals are now online only and require a special pass and many are restricted to academics. Most developments are having six students to a 2 bedroom condo and the vacancy adverts on campus are advertised in Chinese to Chinese students. The splendid isolation of SFU is its main drawback. Everyone, faculty and students, get off the 300 metre “mountain” as soon as possible. This dreadful Michael Geller development might bring money to SFU, but it doesn’t bring Life.